I am glad to be writing this particular (rushed, see end) post as it involves corpus linguistics and I have not done such a post for a while. It is also about my current interest – Columbia School linguistics. I have been over the years less enamored of the power of corpus linguistics for language teaching. It is certainly very useful to access descriptions of language but that is not enough. Explanations are also needed. Columbia School (CS) linguistics is about analyzing invariant meanings that motivate choices in both grammar and lexis. It is about one form to one meaning mappings – an ideal aim when looking to help students. Nadav Sabar in 2016 analyses the use of some and any. The following borrows heavily from this paper. Formal accounts could only say that any is also acceptable as in she didn’t meet anyone and is unconcerned with why the writer chose some in this case. Formal accounts use the sentence as unit of analysis and see meaning as compositional – i.e. the meanings of individual words in a sentence add to the whole. CS uses signs (pairing of symbol to meaning) as the unit of analysis and sees meaning as instrumental rather than compositional. That is the individual meanings of signals need not add up to sentence meaning. There is a distinction between linguistic code that has an invariant meaning (that always corresponds to a linguistic signal) and interpretation of the code which is the subjective outcome of messages. Meanings are very sparse in that they do not encode messages but only offer prompts that may only suggest message elements. I.e. some as RESTRICTED suggests limits, internal divisions, boundaries while any as UNRESTRICTED suggests no boundaries, limits or divisions. Note that this does not mean that the domain in question in reality has no divisions or boundaries. Just that the reality is irrelevant to the message. Also note that in a pedagogical grammar such as Martin Parrott’s this meaning division between restricted and unrestricted is only described for stressed SOME and ANY. In 2) some is used because the message suggested is a restriction on the set of things people see and say. The context drives the inference as to the nature of the restriction – suspicious looking things. Any could also have been used but that would not have been as effective a message – any would have suggested no restriction i.e. people should call no matter what they see. Similarly in 3) any is used because there is no restriction on the domain of times of the day. So now for 1) we can see some is used because the message suggests a restriction of the set of people Yvonne did not meet, and the context shows that this restriction as people who may qualify as marriage potential. Now the interesting corpus linguistics part. Here others is used to refer to a different subset of people within the domain of Federal workers. This message element is also suggested by some – RESTRICTED. This does not mean there is only one reason for the choice of these forms rather that this message feature of internal division is one reason out of many possible reasons that has motivated the choice of these two forms. To test this claim generally we can look at a corpus to see if there is a higher than probable chance that others occurs with some more than others occurs with any. The table percentages and significance test supports the claim that there is one message feature that motivates use of both some and others. 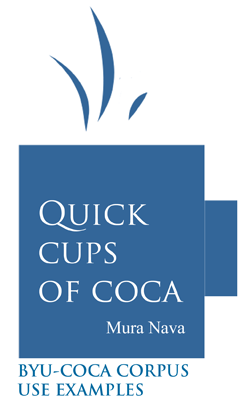 Note that the meaning hypothesis itself is not directly tested; it is only indirectly tested via the counts in COCA. Sabar goes onto to test both qualitatively and quantitatively other signals that contribute to the meaning hypothesis of some – RESTRICTED and any – UNRESTRICTED. Here can we say that singular other contributes to a message meaning of unrestricted? I have no idea as I have not had time to explore this further! I hope dear reader you forgive the rushed nature of this post but I wanted to get something up before the risk of forgetting this due to holiday haze! Nadav Sabar has pointed out that he looked for others in one direction i.e. following some/any whereas I looked at occurrence of others both following and before some/any. Plus in a new version of his paper a window size of 2 is used instead of 9. Parrott, M. (2000). Grammar for English language teachers: with exercises and a key. Cambridge University Press.